A New Hampshire business owner is sounding the alarm after he found a flier near the University of New Hampshire campus in Durham connecting young, vulnerable students with "sugar daddies." The piece of paper was pinned to a bulletin board outside the Town and Campus store. The owner ripped it down right away, but the "sugar daddy" ad is popping up elsewhere, so police are asking people who see the fliers to take them down. For 56 years, Town and Campus has not only sold students their UNH gear, but it has also been a safe haven for kids far away from home. "We treat them in here as family," longtime Town and Campus employee Rich Many said. So when Many saw the "sugardaddyforme.com" ad on his bulletin board, he ripped it down and notified authorities. "This was a way to take action to protect them from anything harmful," Many said in an interview Tuesday. necn found the flier posted elsewhere near campus. "It probably was very strategically placed," UNH senior Kacie McFadden said. The ad connects financially unstable co-eds with "sugar daddies" who will, according to the advertisement, pay students cash for being a "dinner companion." "It can be really dangerous - you have to really know who you are talking to," McFadden said. "I pay my rent, I pay for my own food, I deal with it all myself," explained UNH Junior Ashley Stratton. "I can definitely see how people would be attracted to that." UNH senior Emily Costa said she is mature enough to understand the implications, but worries about her younger sister, who is a freshman. "She's worried about money and I don't want her to fall into this trap, she's a very trusting person," Costa said. The manager of Sugardaddyforme.com - Peter Stolz - told necn over the phone, "We didn't create it, nobody at our site does that kind of advertising anywhere, especially not on a college campus." So while it's still a mystery who put the fliers up, students say it's reassuring to know their community will take them down. 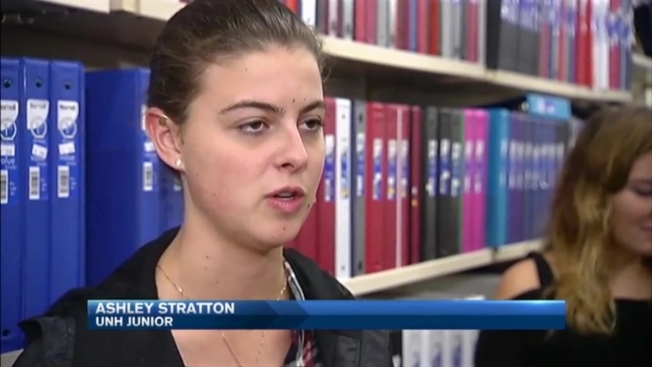 "I really appreciate them doing that," Stratton said. McFadden agreed, saying, "Durham is a really safe place and I think it is because of people like that." The UNH dean of students, the Durham police chief, and the Durham town administrator all tell necn they are well aware of the situation. As of Tuesday evening, they had no reports of students getting involved with the website.